Live. Life. Better is the slogan that Greenwich V mall adopts; a shopping mall within the serene landed residential estate of Seletar Hills. As a retail and lifestyle hub, you will discover a vibrant blend of F&B concepts, lifestyle stores, retail shops and services, including a Cold Storage and food court Kopitiam. Besides, this village-like mall offers tantalising F&B choices ranging from Paradise Inn, The Coffee Bean, Cedele, Rakuichi Japanese Restaurant, Toastbox and BBQ Chicken and services including Guardian Pharmacy, 7-Eleven, Video Ezy, medical clinic, children enrichment schools and a pet grooming shop. As one of the pioneer malls in Sengkang New Town, RIVERVALE MALL provides popular shopping destination to residents living within the vicinity. Situated beside the Rumbia LRT station along Sengkang LRT East loop, Rivervale Mall has been growing together with Sengkang Residents. NTUC Foodfare food court at the first floor and other popular shops, such as Daiso, MacDonald's, NTUC FairPrice, adds the attractiveness of Rivervale Mall. To make it more convenient for residents, it provides free shuttle bus service. The detail of Rivervale Mall shuttle bus route is as follows. With its history traced all the way to 1930's, ALEXANDRA HOSPITAL was a British Military Hospital. In 1971, the British Military Hospital was handed over to the Government of Singapore and it was renamed Alexandra Hospital. Restructured on 1st October 2000, it became a member of the National Healthcare Group. Its facilities and services were upgraded to serve patients better. From August 2010 till 2014, Jurong Health Services assumes management of Alexandra Hospital. Under the new, Alexandra Hospital continues to serve patients at Alexandra Hospital and provide a comprehensive range of clinical services and care for the community, such as anaesthesia, dermatology, eye, dental, geriatrics, ENT, annual health check-up, etc. Located on 378 Alexandra Road, Alexandra Hospital is accessible by public transport, MRT, and self-drive. With Queenstown station the nearest MRT station, shuttle bus is provided for patients' convenience. The shuttle bus makes 3 stops and the detail of the timing is as follows. The Marina Barrage creates Singapore’s 15th reservoir; boosts Singapore’s water catchment. The result of Minister Mentor Lee Kuan Yew’s vision nearly two decades ago, it was built across the mouth of the Marina Channel. As one of the Singapore's latest downtown icon in Year 2010, Marina Barrage is a lifestyle attraction for family gathering, kids playing kites, wedding photos shoot, and a place for couples to enjoy sunrise and sunset. Unaffected by the tides, its water level is kept constant all year round. Hence Marina Barrage is very suitable for all kinds of recreational activities such as boating, windsurfing, kayaking, and dragonboating. The Marina Barrage is accessible by bus and MRT, with Marina Bay as the nearest MRT Station. Beside SBS Bus 400, shuttle bus is also provided to serve residents and tourists. 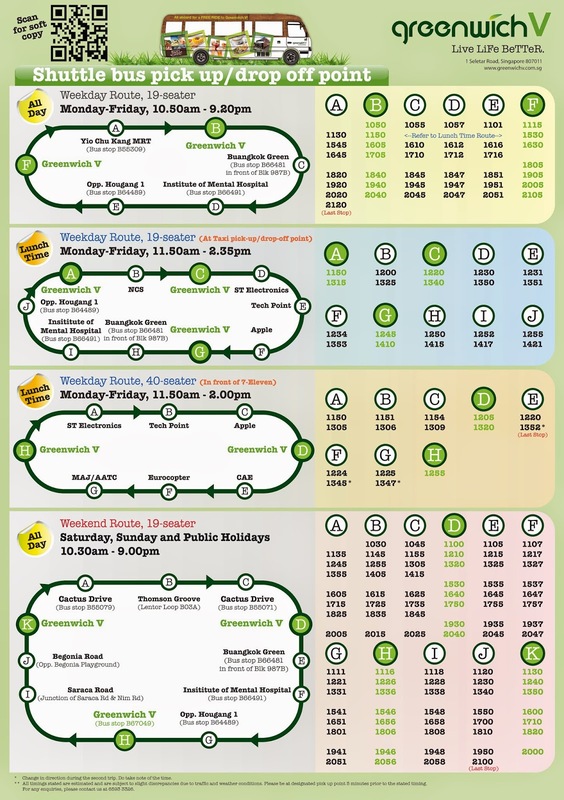 Schedule of SBS Bus 400 and Marina Barrage Shuttle Bus is as follows. ***Scheduled things are estimated and subjected to traffic conditions. People who want to travel from City Square Mall or Farrer Park MRT to Lavender MRT and vice versa. Residents who stay around Kitchener Link (City Square Residences, Residences @Somme), Rangoon Road (Urban Loft, R66 Residence), Petain Road (Studios @Mame), North Bridge Road, Kallang Road. Shoppers of City Square Mall, Mustafa Centre, Serangoon Plaza, Textile Centre, Garden 7 Mall. Visitors of Singapore Buddhist Federation, Sakya Muni Buddha Gaya Temple (Temple of 1000 Lights), Sinda, People's Association Headquarters, Masjid Angullia, Hinghwa Methodist Church, Taipei Buddhist Centre, Srimanmatha Karuneshvarar Temple, ICA Building, Masjid Malabar. Students of Umar Pulavar Tamil Language Centre.